The information on this web site is not intended to provide nor does it constitute ,medical advice. Preparing for a child's first year at college is hard under "normal" circumstances, for my son to live away from home gluten-free and dairy free for the very first time is going to be hard. I want my son to live at home and attend a local college, however I cannot let it be about "me" and what I feel might be best. My son will be taking his SAT next month and will be a senior in August. We are planing to visit a few colleges this summer. Hoping to have a list of five. Is that possible to find FIVE colleges that can provide a "safe" gluten free meal for my son? Do you have a 504 plan for College? How did you prepare to live away from home gluten free for the first time? Do/Did you attend a gluten free friendly college? If so where? Any books, web sites you can recommend? There are many reasons to avoid gluten. Many people are gluten sensitive and do not even know it. The most severe form of gluten intolerance is Celiac Disease. Celiac Disease is the small tip of a VERY large iceberg. Just because you might test negative on a Celiac panel does NOT rule out gluten sensitivity. Many of these symptoms are also Lyme Disease symptoms, and can indicate inflammation in the body. Wheat is a pro-inflammatory agent. A pro-inflammatory agent is rapidly converted to sugar, causing a rise in the body’s insulin levels, causing a burst of inflammation at the cellular level. Wheat is a relatively new food for the human race. Ancient man, the hunter-gatherers, lived on meat from the animals they hunted, fish and wild vegetables, fruit, nuts and seeds that they gathered. It was not until the agricultural period that began about 12,000 years ago that wheat and other grains were introduced. This is not a long enough time for the human body to adapt. Your digestive system provides a barrier between the foods you eat and your blood stream. If this barrier breaks down gliadin/gluten gets into the blood stream. The immune system reacts to the gliadin/gluten and they become a toxin. Any immune response releases chemical mediators that cause inflammation and leads to symptoms such as pain, edema, and headaches and so on. Those suffering with Lyme disease can benefit from a Gluten free diet. Lyme Disease is a multi system disease. Gluten sensitivity can also make your symptoms worse and prevent you from healing from Lyme Disease. Gluten-free "should" have more than one meaning. I'm sure it can be a fad diet for some, but it is really serious for others. Gluten sensitivity is a really large gray area we simply can NOT over look. Gluten sensitivity is REAL and is a serious issue for many. It should not be frowned on. Gluten sensitivity isn't any less serious because a person might not have a "Celiac disease” label. We have come along way however, mainstream medicine is often slow to change and doesn't always offer alternative testing methods. If you have Lyme Disease, you might not realize gluten is an issue. You have to give your body enough time to heal before you notice a change. Refined wheat has little nutritional value. Humans don’t fully digest wheat. We would love your thoughts and comments. Don't forget to enter our Holiday giveaway! My name is April and I live in PA with my husband and children. Our children range in age from 19 years thru under two. They keep us pretty busy but we wouldn't have it any other way. Most of our experience is lifestyle based, as I am currently studying to be a nutrition consultant. We have experience with celiac testing, swab testing, stool testing, genetics testing using both alpha and beta subunits of HLA DQ , and allergy testing. Since some of our children were diagnosed with gluten-intolerance we have immersed our self in a mission of making life tastier and easier for people living gluten free for personal preference or medical condition. 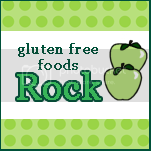 We started a local support group /click on "green" gluten free button above. "Here" I will blog about Gluten free research, recipes and tips on living happy, healthy and gluten free.